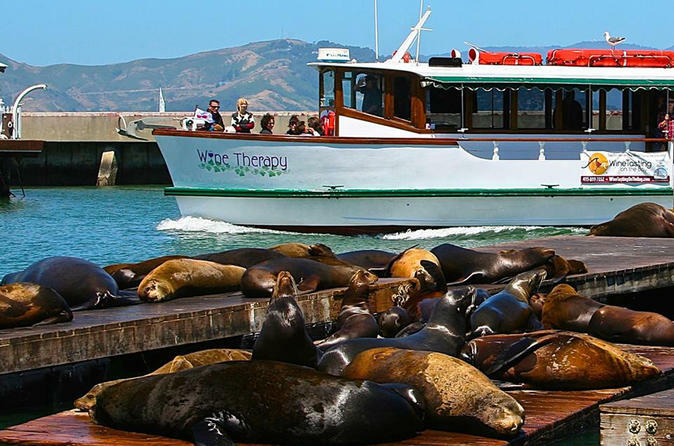 Experience this magical wine tasting cruise on the San Francisco Bay. The 2-hour cruise on San Francisco Bay includes five tastings (a flight) of wines from Northern California wineries or one drink (beer, cocktail or non-alcoholic options). Your cruise will commence at 12:30pm, once you board your boat in Pier 39 near Fisherman's Wharf. Live commentary will also be provided by your guide on board the 24-passenger vessel, with panoramic windows from inside the heated interior cabin and viewing benches on the covered deck outside. Baguettes, cheeses and crackers are included to complement the wines. Boarding 5 minutes prior to departure. To kick start your cruise, you will board your vessel, aptly named Wine Therapy, at 12:30pm near Fisherman's Wharf. Once on board, you can take a seat in the climate-controlled cabin or stroll the outdoor covered deck for optimal sightseeing on San Francisco Bay. The 2 hour route typically travels from Pier 39 to the Golden Gate Bridge, around Alcatraz, and back alongside the city skyline to the Ferry Building and returning to Pier 39. Inside the floating wine tasting room, you will savor a wine flight that includes four tastings of regional reds or whites. A wine steward ensures a memorable voyage for wine lovers without heading all the way to the Northern California wine country. You will be able to choose among standard or premium wine tastings, accompanied by included snacks, with additional alcoholic drinks available to purchase at the full bar. Afterward, your cruise will conclude with a return to the pier.